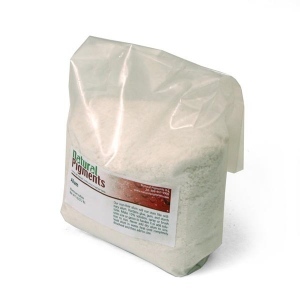 Details Aluminum sulfate is a widely used industrial chemical, sometimes referred to as alum. 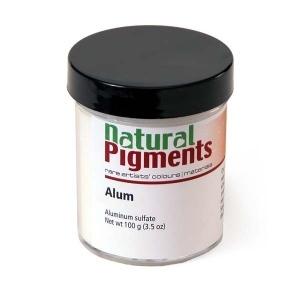 When dissolved in a large amount of neutral or slightly-alkaline water, aluminum sulfate produces a gelatinous precipitate of aluminum hydroxide, Al(OH)3. In dyeing and printing cloth, the gelatinous precipitate helps the dye adhere to the clothing fibers by rendering the pigment insoluble. 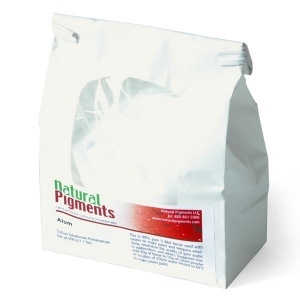 It is also used to fix dyes on mineral substrates to produce lake pigments by precipitating aluminum hydroxide with an alkali. It is most often used by artists to harden glue and starch sizes. Spray a solution of aluminum sulfate and water onto rabbit skin glue or onto gesso or chalk grounds to harden them or add directly to size. For size, use 10 grams for each 100 grams of dry glue. Dissolve the aluminum sulfate in water, heat until completely dissolved and add the warm solution to the glue solution. Store in a cool, dry, ventilated area away from sources of heat, moisture and incompatibilities. Aluminum sulfate absorbs moisture and becomes a safety hazard when spilled because it absorbs moisture and becomes slippery. Containers of this material may be hazardous when empty since they retain product residues (dust, solids); observe all warnings and precautions listed for the product. Aluminum sulfate may cause irritation to the respiratory tract. Ingestion of large amounts may cause nausea, vomiting and abdominal spasms. May cause irritation upon skin and eye contact. Refer to Material Safety Data Sheet. No information is available about its potential hazard to the environment. If product is spilled, comply with Federal, State and local regulations on reporting spills. Refer to Material Safety Sheet and labels for further details.